Wine Review: 2008 Marques de Caceres Rioja Crianza | Wine Splash! As the Michigan nights get progressively cooler, some big, bolder red wines are in order to keep the heart pumping and stay warm. We were glad with our decision to open up a good Rioja like this one. As Fred said to Bob Cratchit in The Christmas Carol, “A Cheery warmly goodly wine that will race through your veins with little torches”! Which could be a slight exaggeration, but I kept warm enough to tap out a quick review on this wine. On sight, this wine was deep ruby in color. On the nose, ripe raspberry, cherry, and a hint of vanilla was flirting with my senses. The spicy and exhilarating fragrance has teased us enough! The mouth feel was full bodied, rich, and a sensation of some fine tuned tannins. Flavors of black cherry, ripe raspberry, toast, and vanilla spice! Complex layers which lead into a good lengthy finish. Pair with medium to strong cheeses, spicy bbq ribs, grilled steak, and tomato based pastas. The flavors worked well together and it gives this wine some nice character and elegance. I am hoping the 2008 vintage is still available since I did buy this wine about a year ago. We really enjoyed the 2008 Marques de Caceres Rioja Crianza and give it a rating of 88 points. 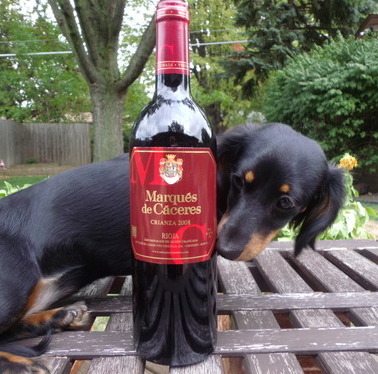 Our Wine Dox Daisy gives this wine 3 out of 4 Paws! If you have a 2008 vintage, drink it now through 2014. WineSplashing!! Damn, saw it at the grocery store a couple weeks back and meant to pick one up…but didn’t.